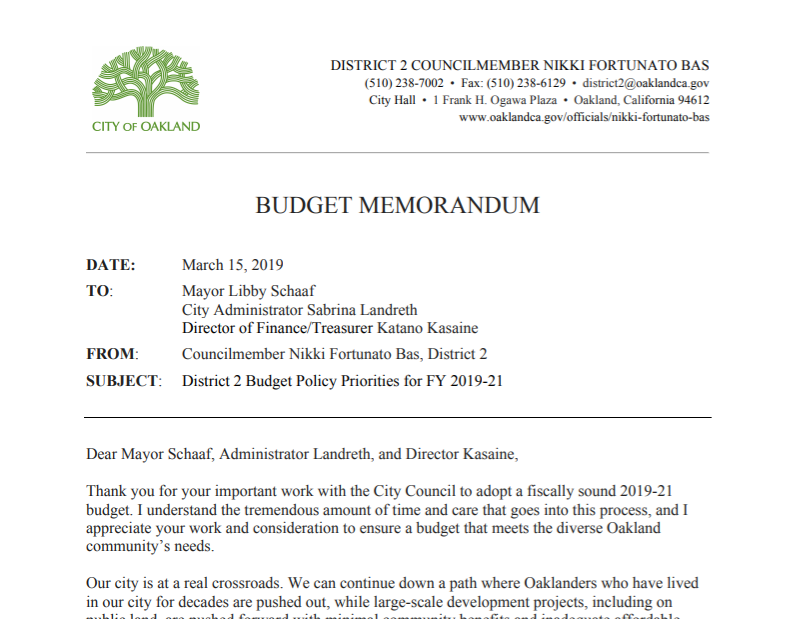 On Friday, March 15, Councilmember Bas shared her budget priorities with the Mayor, Treasurer, and City Administrator as the process of developing Oakland's 2-year budget for FY 2019-21 begins. View her budget priorities at bit.ly/D2BudgetPriorities and stay tuned for a survey link. Your input is critical and we look forward to working with District 2 residents and neighbors across Oakland to help develop a budget that meets our diverse community’s needs. Councilmember Bas believe our budget should allow us to grow as a City with the goals of equity, inclusion, and sustainability while making decisions with community engagement, transparency, and accountability. Also, please join us at our District 2 Budget Forum on Thursday, May 16 at Lincoln Recreation Center (250 10th St). Light dinner at 5:30; program begins at 6:00 p.m.